The memory is still vivid in my mind. It was a spring day fifty years ago. I was ten years old when our family – mom, dad and four of us (of which I was the oldest) loaded up the Ford station wagon and drove from our home in rural Onslow County, NC to Rocky Mount. Of the six who took the trip five would make the drive back home. Previous family trips never had us stop in Rocky Mount. We would always pass through on US Hwy 301. Interstate 95 wasn’t yet built. But Rocky Mount was never a destination for us, since our reason for heading that northerly direction was to go farther north to the Washington, D.C. area to visit grandparents, aunts, uncles and cousins. This trip was different. My memory doesn’t include some of the details. I can’t recall if we were talkative or if we fought over our space in the back seat. Most likely we did. And maybe that was a good distraction for my parents. Nor do I remember how long the trip lasted, although I know we were back home in the afternoon. My guess is that I got to ride up front beside mom on the return trip, but I don’t remember her words or emotions. But it had to be emotional for her. We had taken Dad to the train depot in Rocky Mount, where he boarded a train. Somewhere, I guess, he boarded a plane. But he then spent a month in southern California training for survival. When that month was up he got on another plane and wound up in southeast Asia – South Viet Nam – where he would spend the bulk, other than R(est) and R(elaxation) of the next twelve months. Dad is eighty years old now, but still very much a Marine. He was just about to turn thirty when he deployed. A father of 4 with one on the way. Yet I don’t remember ever any regrets being expressed in my hearing, either before his time there or after. Not a word. During those 13 months in absentia Dad missed some big events at home. My first Little League season. He wasn’t there to play catch or coach like he would in subsequent years. My spiritual birth and then my baptism took place while he was gone. I joined the Scouts and went on my first camping trips without him. He got word via the Red Cross that his number 5 child was born that fall. And I’m sure that there were other big happenings Dad missed out on in that year. Honestly, everything he missed out on was a big deal to him. And somehow my mother played the role of both parents those 13 months. Four of us were in school. A baby at home. Yet, we never missed church. I never missed a game or a Scout meeting. I just missed having my dad at home. Am I resentful of that? No way! I knew from my earliest remembrances that my dad was a Marine (and I was and am proud of his service) – that he had chosen this career that would take him from us not once, but twice for a year at a time in my childhood. Mostly I have no regrets because at least my dad came home. Monday is another Memorial Day, and with each one I remember my dad’s service, not because Memorial Day celebrates him. It does not. I think of Dad because of the stories he has told me of his Marine buddies who did not come home. 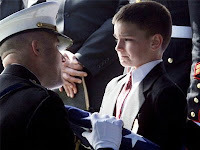 I see the tears well up in his eyes as he speaks of seeing “the bodies of Marines stacked up like cord wood”. Fifty years ago I learned in a very personal way that freedom is not free. I went to school with other Marine’s kids whose dads came home in flag-draped caskets. It is for those Marines, sailors, soldiers, airmen and coasties – the ones who made the sacrifice of their own lives that others could be free – that we celebrated Monday. It might be easy to complain about the weather on Monday “ruining” our holiday. But there would be no holiday had hundreds of thousands in our country’s history not laid down their lives so we could be free to celebrate. God bless the USA. And thanks for all who gave it all. I'm well aware that the little boy in the picture could have been me. In the US politicians love to quote Jesus, especially when they take His words and apply them to their cause or agenda. Often those quotes are taken out of context and make it sound as though Jesus would support some modern social and moral issues when the entirety of Scripture shows that He would not. The best known and misused words yanked out of context are probably "Judge not". Then when some Christian speaks up and says, "Hey! That's not all that He said! ", or "You got that all wrong", the Christian is chided for being "unchristian". Happens all the time. And then His instructions to His disciples about His kingdom are frequently and wrongly applied to man-made governments like ours. That results in the government attempting to do the things Jesus gave to the church to do. Then, as society accepts the government acting as a charitable organization the church and other charitable organizations are seen as unnecessary. Taxes (compulsory) are raised to provide for these services, which takes away from the citizens' ability to contribute willingly to the church. So, Jesus is convenient when His words can be used to support governmental social action. But what about His words that don't support the cause? Today I'm thinking of this parable, from Matthew 20 about a business man, his workers and equal wages. “For the Kingdom of Heaven is like the landowner who went out early one morning to hire workers for his vineyard.He agreed to pay the normal daily wage and sent them out to work. “At nine o’clock in the morning he was passing through the marketplace and saw some people standing around doing nothing.So he hired them, telling them he would pay them whatever was right at the end of the day. So they went to work in the vineyard. At noon and again at three o’clock he did the same thing. I'm not hearing that parable quoted in the news by either the pundits or the agencies of government. I wonder what's wrong with it? (I know the answer.) It is against the law for the owner of the business to do what he wants with his money. Apparently. Part 2 to the last post.